* Update 5/2/11 11:30am EST * We have closed this webinar as we have reached our max capacity. Please email us at lgbthealthequity@gmail.com if you would like a copy of the slides and the recording from todays call. 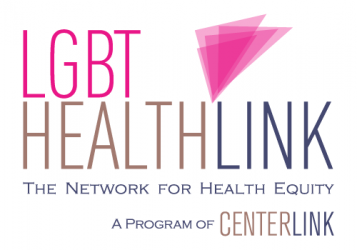 Thursday, June 2nd at 4pm – 5pm EST, the Network staff with Network members from CenterLink, Equality Federation, and the National Coalition for LGBT Health will be jointly co-sponsoring a webinar about an opportunity for organizations to advocate for local LGBT inclusion in a newly announced pot of $100M healthcare reform money, Community Transformation Grants (CTG). Please join us with longtime Network member and co-presenter Dr. Barbara Warren on how to use this opportunity to make sure your local health department(s) include LGBT people in their strategic planning and proposal writing. About a week ago CDC announced the long-awaited applications for the Community Transformation Grants. CTGs are authorized under the Affordable Care Act of 2010 for state and local governmental agencies, tribes and territories, and national and community-based organizations. These grants offer $102 million new dollars for health prevention to spread across the U.S. We worked with the allied national networks consortium to deliver our Joint Policy Statement on How to Include Disparate Populations in Health Funding Awards directly to the people developing the CTG language. They loved the line-by-line suggestions and we see many of them incorporated into their Request for Applications, which really strengthened the disparity focus in this funding stream. 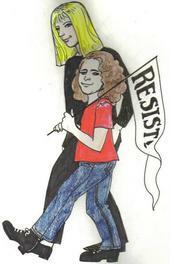 But we are a less pleased with the LGBT integration, you can read more about that here. But… the feds have committed to engaging local LGBT groups in Community Transformation Grants… so this call will teach local groups what steps you can take to make sure LGBT people (and maybe your group?) are including in your region. Local health departments are writing their proposals for these funds right now, so it’s important we all advocate for LGBT inclusion quickly. Where: **** CLOSED***Please RSVP online to register and we’ll send you call information the morning of the call. If you issues registering, please email: lgbthealthequity@gmail.com. 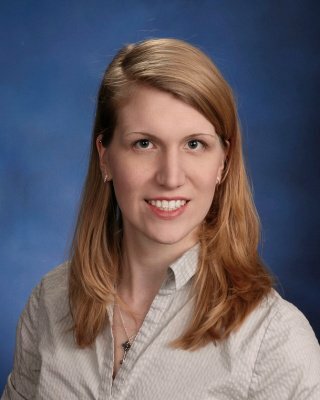 PLEASE NOTE: If you plan on submitting a proposal letters of intent, they are due June 6, 2011. To see the application, whether you’re eligible, and how to apply, visit their website: http://www.cdc.gov/communitytransformation. The goal of this BrownBag discussion is to share stories, lessons learned, strategies and successes through a discussion of the pros and cons of incorporating LGBT data as well as how these questions have been implemented in the field from state LGBT surveillance efforts. We would love to bring together state representatives, researchers, and community folks that have implemented LGBT surveillance, or have been working on incorporating efforts in their state. Join us on Monday, November 22nd at 4pm (EST). Please let us know if you are able to attend by completing the Registration below. Call/log-in information will be sent out Monday morning. About the BrownBag Series: It’s about linking people and information: The BrownBag Networking call series is designed to be an open space for, you guessed it, the Network. So pull up a chair and enjoy a virtual lunch with us to network, share, and collaborate with collogues from around the country. For descriptions of past BrownBag Webinars, see our blog. Reporting on the Transgender Inclusion within Organizations Serving the LGBT Community BrownBag Webinar on November 11th. 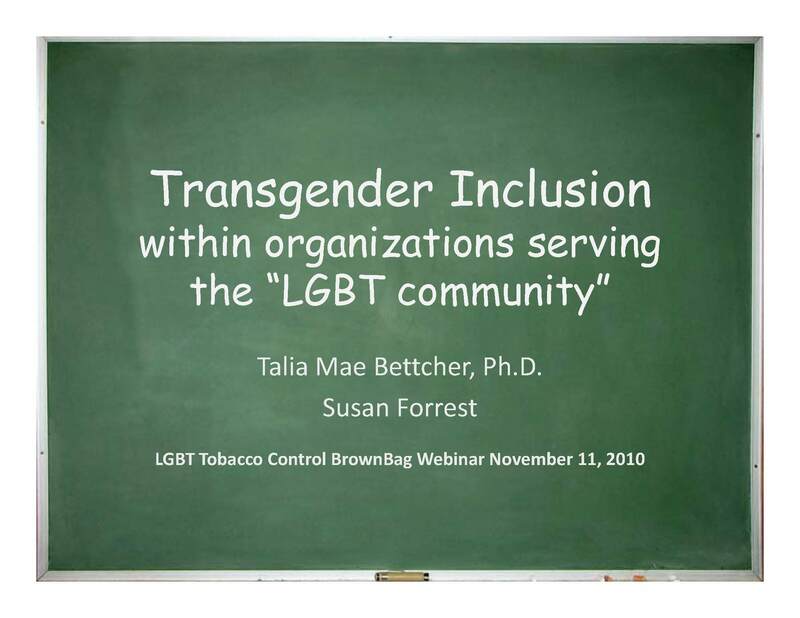 On November 11th, we held our Transgender Awareness Week BrownBag Webinar on Transgender Inclusion within Organizations Serving the LGBT Community with special guest co-presenters Susan Forrest and Talia Mae Bettcher. On the webinar, Susan and Talia provided great background on how the transgender community has historically, and is still often, been excluded from the LGBT community. They spoke about challenges of inclusion within the GLBT community like unique tensions that trans people experience from gays and lesbians. This is important to consider when working with the entire LGBT community since trans people may be cautious of even gay & lesbian/LGBT spaces since they feel (and often are) unwelcome in these spaces. In addition to discussing how to best understand how transgender people have been excluded by the gay, lesbian and greater GLBT community as well as how to be sensitive to transgender people, Susan and Talia mentioned how agencies can welcome the transgender community. Susan and Talia started the conversation with a very basic suggestion for including the transgender community by asking whether we have an “Us versus Them” mentality. Agencies should not be thinking about how to bring “them (transgender people)” to “us (the agency)” as agencies should be already seeing transgender people as part of “us” (the agency.) 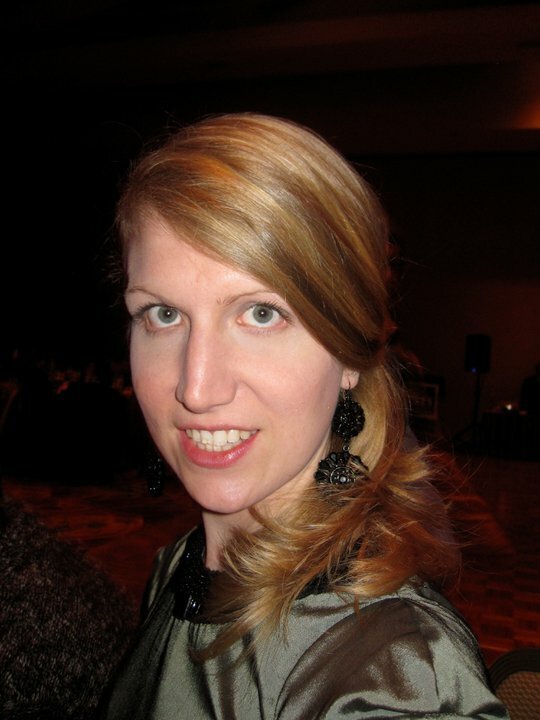 A good start is doing specific outreach to the trans community, offering specific trans services (medical consultations, legal advice, etc), supporting and advocating for trans events like Transgender Day of Remembrance as well as hiring trans individuals. It’s important to realize trans people should not just be hired for specific purposes of outreach or service just for the trans community, but can be seen being valuable employees serving other functions too. Taking these important steps will gain your agency the respect and trust of the trans community who will be more likely to be drawn to the organization. On an administrative point of view, the unique yet justified needs of trans people should be appropriately addressed. For instance, trans people should always be referred with the correct pronoun/name. Similarly, trans folks should not be restricted in bathroom access, but your agency may want to look into converting some bathrooms into single stall of gender-neutral like those listed on this website: safe2pee.org. This blog doesn’t begin to do their presentation justice as there was tons of information and material, but both the slides of the presentation and audio recordings of the presentation are available below. So you should check it out! The Learning Trans Website is a project of BrownBag presenters Susan Forrest and Dr. Talia Mae Bettcher to produce and highlight trans community-produced knowledge. National Transgender Discrimination Survey Report on Health and Health Care with nationally significant statistics on transgender health, health care experiences as well as tobacco prevalance rates as discussed on the webinar. Recommendations for Inclusive Data Collection of Trans People in HIV Prevention, Care, and Services – examines the issue of reliable inclusion of the transgender population in HIV data collection. Topics include questions to ask, helpful implementation of data collection, and resource assistance. Safe2pee.org – A community-produced website dedicated to mapping safe restrooms for transgender people across the country. This is both a great resource and an opportunity to contribute. Transgenderdor.org/ – A website dedicated to raising awareness of Transgender Day of Remembrance (TDOR) and promoting TDOR events across the country.